If you are looking for a no-nonsense shopping list app that will help you stick to the budget, Shop Calc might turn out to be what you need in all aspects. It is free, feature-rich, intuitive and easy to use, but most importantly, useful. If sticking to a budget while shopping is a problem for you, and numerous unplanned purchases that were not on your list, but made it to your cart just because you saw them can push you beyond your limit, you may want to discipline yourself to stop buying stuff you don’t need. 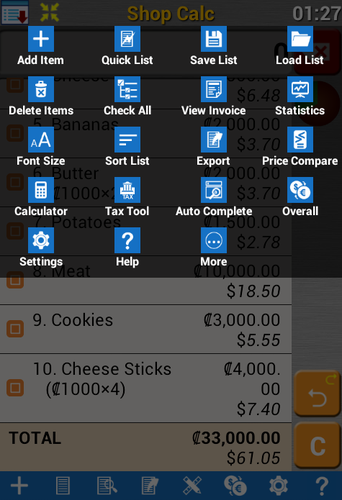 The free version has most features found in the Pro, except for the bar code scanner, voice input and 4-row keyboard. The paid version has no ads and requires no device permissions. 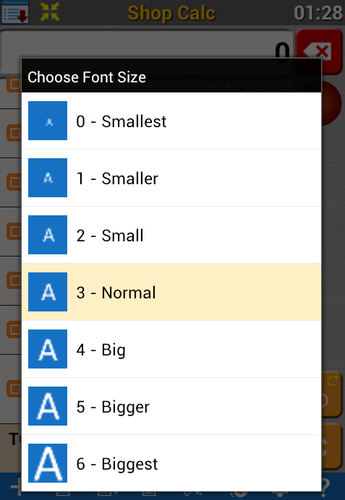 Having said that, the free app excels in every aspect, and many users prefer it like that. The app has gained a huge amount of user attention since its release, although it may not be in the featured reviews of mainstream tech media, which is a drastic overlook. The app is surprisingly lightweight in size, as opposed to its load of features. It does not consume any significant amount of power, or GPU and RAM. The major requirement is Android 2.2, so it will run even on the older devices. Let us see what you can do with it. Shopping List: the app lets you create comprehensive shopping lists with the name of the product, number of items per purchase, item’s price, tax and discount. 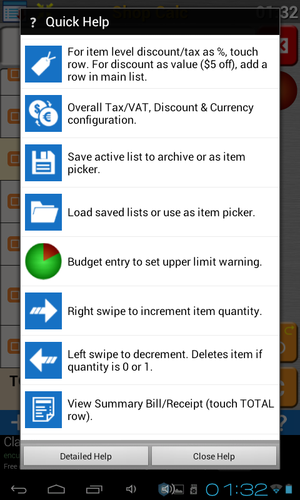 Budget tracker: you can create a budget limit for each shopping list, and as you add products to it, the app will calculate total amount, displaying how close you are to the limit. 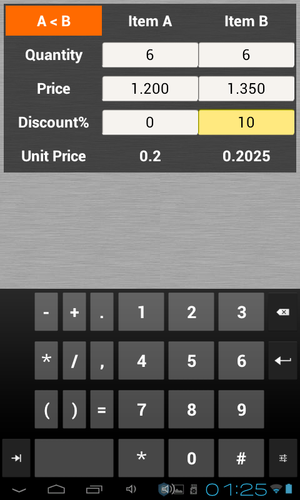 In-built calculator and price comparator lets you do the calculations and compare products in different stores. Support for multiple currencies: this feature is just awesome for anyone traveling or residing abroad, and if you are constantly converting prices into dollars/euro, the app does just that, displaying the price both in your primary currency, and secondary, which makes it an indispensable travel companion. Even though developers suggest new users watch an introductory tutorial video, a more or less tech-savvy user will sort it out on the go. However, if you are downloading the app for your Mom, do show her the video, it will spare you the nerves. 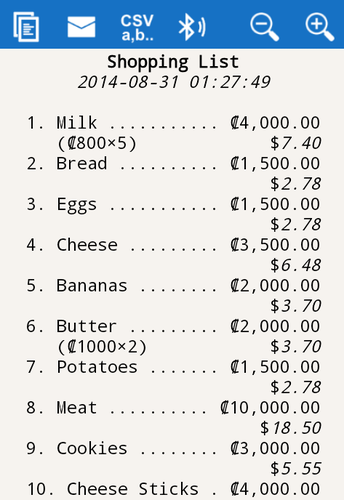 The first neat thing about Shop Calc is once you’ve entered all the items on the list, with their prices and amount, you see your receipt amount. This makes shopping a lot safer, especially for those who have problems managing their budget. If you have been trying to solve your debt problems, you might have switched to shopping with cash, instead of credit cards. Cash brings significant dose of sobriety into the vortex of consumerism, and Shop Calc helps you stay within the limit of the cash you can spend per one shopping fest. Inputting items on the list is easy, and once they are stored, you can re-use them in new lists. 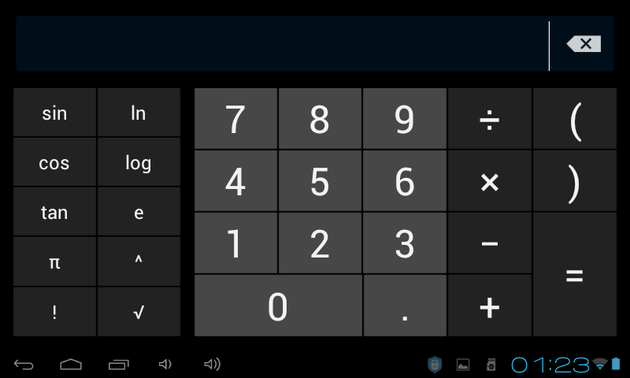 If you need to calculate the price and tax, Shop Calc has you covered, too, while setting several currencies is bliss for anyone on a travel, or an expat still converting local prices to dollars. The app is handy and lightweight, so your device won’t run low on battery juice if you have the app running all the time you are wandering along the supermarket aisles. It also has a handy calculator you can use to count on the go and see how an unplanned item will affect your check-out receipt. 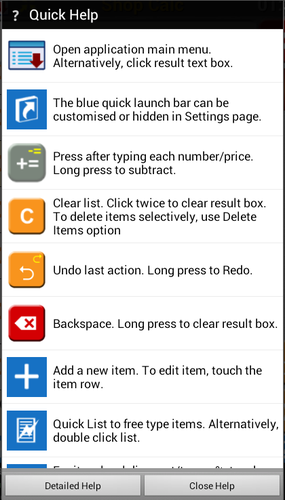 The user interface is functional, without unnecessary glam, but it puts focus on the features you need to find fast. I found navigating to and from windows easy and intuitive. The icon menus are quite self-descriptive, and users have a few options to customize toolbars and shortcuts, although I did not find it necessary. Being a newcomer to the app, I prefer to keep the default settings, although the more I familiarized myself with the app, the less I wanted to customize it. 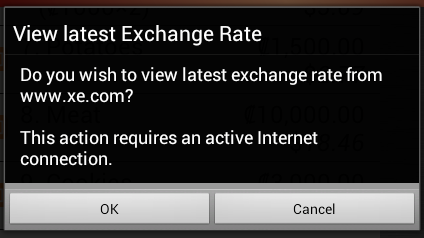 You can add the exchange rate quite easily. The app does not have an automatic service to pull data in real time, but takes you to an exchange rate website, where you can check the rate and input it manually. On the one hand, you won’t need to do it on a daily basis because rates don’t influence that much regular grocery shopping receipts. On the other hand, if you are a meticulous shopper and want to stick to the highly accurate rate, check that number the day you shop. Overall, the interface is loaded with information, but the layout and presentation make navigation seamless and intuitive while users are able to customize some of its elements to suit their needs best. 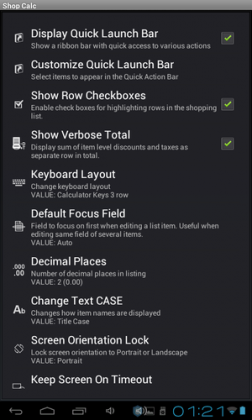 The app learns as you shop, and creates a product repository you can tap into when creating new lists. Easy to use, has a mild learning curve for those users who only use their devices to make calls or send text messages. Any user with moderate experience dealing with mobile apps will sort it out quickly. Can be used for so much more than just shopping lists: to keep track of game scores, for repeated measuring or mathematical games, and more. 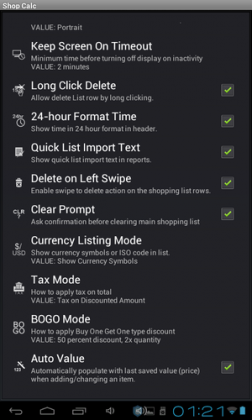 This is not a con per se, rather a note to those who purchase the paid app – the barcode scanner won’t get you product prices or names, but displays product information, and if you enter the name and price once, the app remembers that data. To be able to use barcode scanning feature, you must have a device with a camera and barcode scanning app like Zxing Barcode Scanner. Also, since the paid app does not have any special permissions, which is great, it does not track your location, and apps that do fetch prices need access to your location and full Internet access. So, it’s a little compromise on a small feature in favor of user privacy and security. If you use coupons, you will need to add a coupon value as a negative price in the main list when adding a new product. I am not sure this is the most intuitive way, though, but developers might make it simpler with the next update. If you want to add tax for one item, touch it once to edit and input tax in the corresponding field. 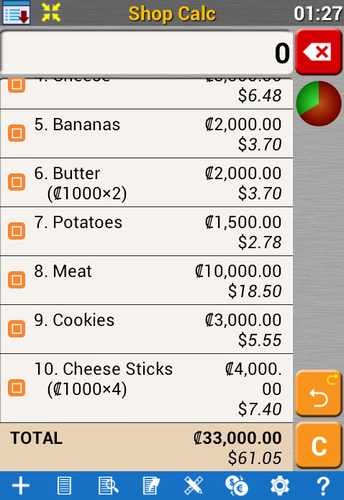 If you want to add tax for multiple items, go to Menu -> Tax Tool. If you want to apply tax to your full receipt, go to Overall Menu. 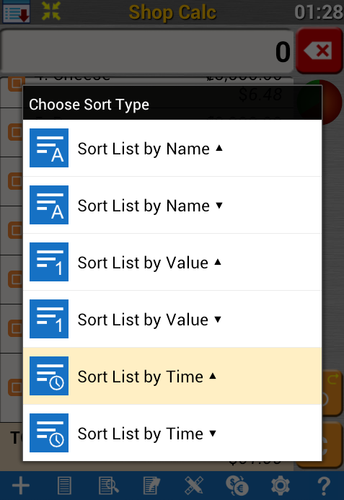 You can export shopping lists from a free app to the paid app as csv or text format. 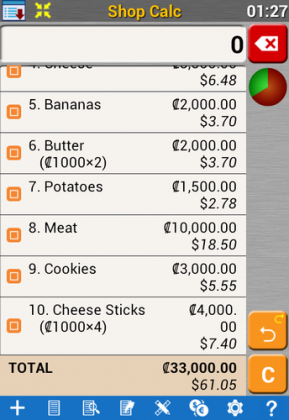 A lightweight, functional and feature-packed shopping list organizer, calculator and currency converter, Shop Calc free app does a remarkable job organizing your shopping and helping you stick to the budget. You can adjust it on the go as you shop, and see your receipt before you move to the cashier, or create your shopping list before you go shopping and have a precise amount of your receipt, provided you know the prices, of course. It will calculate tax and exchange rate, total, coupons and discounts, and let you customize the app itself and your shopping lists on the go without consuming your device’s resources.